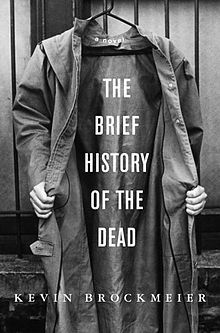 Review: The idea is this book is excellent-when people die they go to The City, a place where you stay as long as you are remembered by someone on Earth. The book follows some characters in The City, as well as a researcher in the Antarctic, Laura. So, remember how I said the idea of the book is excellent? It is, absolutely fantastic. What I didn't think was so great was what the author did (or rather didn't do) with the idea. People in The City live just like they did on earth. They have their memories, jobs, see friends and relatives. They live in furnished apartments, eat food and consume beverages. I kept wondering if there was money exchanging hands. Why were these people working? Did they really enjoy it? What happened with criminals, they certainly live in living people's memories as well, where were they? Alas, none of my burning questions were answered. We also never delved enough into these peoples lives for me to care about them as characters. We did find out that people were dying on earth due to a biological weapon of sorts being distributed through Coke (the company Coca Cola is actually referenced and I'm shocked their corporate office allowed this to be printed). It was also cool when people in The City realized they had one person in common, Laura. Now, let's get to Laura. She's a researcher in Antarctica and finds herself trapped. We quickly realize she's the only human left on earth. She starts a trek across the frozen tundra to find more people and I initially was excited by this adventure. I was hoping for a Martian type experience (you know, she was going to Maverick/engineer her way through survival) but it was quickly apparent that she was going to die, it was not a matter of if, just a matter of when. So overall-while I found the idea of this book unique, the execution was lacking. I could not connect to the characters.